On Sept. 12, a large crowd gathered in Washington to protest ... what? The goals of Congress and the Obama Administration, mainly — the cost, the scale, the perceived leftist intent. The crowd's agenda was wide-ranging, so it's hard to be more specific. "End the Fed," a sign read. A schoolboy's placard denounced "Obama's Nazi Youth Militia." Another poster declared, "We the People for Capitalism Not Socialism." If you get your information from liberal sources, the crowd numbered about 70,000, many of them greedy racists. If you get your information from conservative sources, the crowd was hundreds of thousands strong, perhaps as many as a million, and the tenor was peaceful and patriotic. Either way, you may not be inclined to believe what we say about numbers, according to a recent poll that found record-low levels of public trust of the mainstream media. Progressive media critics often point out that the media too frequently take a "he-said/she-said" approach to politics that boils down to, "Is the Earth flat or spherical? Opinions differ." That may seem like an exaggeration, but Time's handling of the crowd size dispute is virtually indistinguishable from that caricature. Actually, in some ways, it's less honest than the caricature. See, the 70,000 estimate didn't come from "liberal sources"; it came from sane sources, such as the Washington, D.C., Fire Department. Time portrayed the disparate estimates as equally-likely-to-be-true products of ideological observers. In fact, the large estimates from conservatives were clearly false, and the lower, accurate estimates came from official, nonpartisan observers -- and even from some conservatives like Beck's colleagues at Fox News. And the estimates of "as many as a million"? True, they came from conservatives (actually, some conservatives put the crowd size at the 2 million mark. Time has downplayed the dishonesty displayed by one of the very conservatives it later references.) But, more accurately, they came from dishonest conservatives who were lying, lying about how many people were there, lying about where the estimates came from. Lying. Look: The difference between 70,000 people on the National Mall for a protest and 2 million is huge. Seventy thousand people is a good-sized crowd. It's nothing to be ashamed of. It's almost as many as the 85,000 people who attended last Saturday's college football game in Lincoln, Nebraska. But 2 million people? There probably weren't 2 million people in the entire state of Nebraska (population: 1.8 million) last Saturday. Houston, Texas, is the fourth-largest city in America, with just over 2 million residents. Do you know what happens when you drop the population of Houston, Texas, in the middle of Washington, D.C.? Hotels for miles and miles around are booked far in advance. The Metro system is stretched to the breaking point. Thousands of people get trapped in tunnels. It is, in short, unmistakably different from what happens when Missouri plays Bowling Green. I dwell on this because the difference between 70,000 and 2 million people is simply not something about which reasonable people of honest motives can disagree. It is not something that can be an innocent mistake. Dishonest people who wanted to misinform you told lies in order to exaggerate the crowd size. There really can be no doubt about that. But Time not only won't make clear that they are lying, it won't even tell you that they were wrong. Thus, the magazine makes clear right up front that this article is not "journalism"; it is a pathetic attempt to pander to malicious liars. 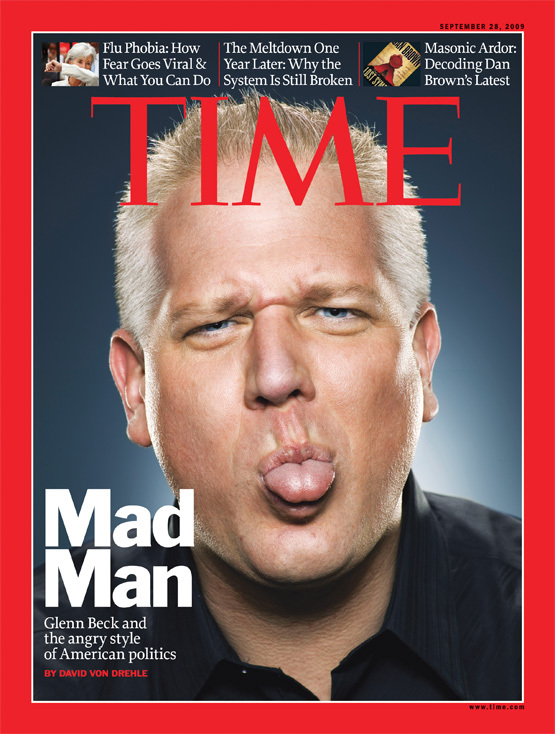 Glenn Beck: the pudgy, buzz-cut, weeping phenomenon of radio, TV and books. ... Beck is 45, tireless, funny, self-deprecating, a recovering alcoholic, a convert to Mormonism, a libertarian and living with ADHD. Indeed, the closest the Time article ever came -- ever -- to indicating that Beck tells lies and spreads falsehoods is this whopper of an understatement: "[H]e also spins yarns of less substance." Oh, snap! That really exposes him for the fraud that he is! Von Drehle does mention in passing that Beck is currently the object of one of the most successful advertizer boycotts in history, sparked by Beck’s assertion that Obama is a racist who harbors "a deep-seated hatred for white people or the white culture." Von Drehle identified the boycott as “a boon” to Beck’s ratings; but he didn’t say that it now includes more than sixty corporations, including Warren Buffett's Berkshire Hathaway and Procter & Gamble. Thanks Time magazine, I needed to see that! i like how time calls him a "mad man" equating him to a fictitious show about people who in the 50/60s lie to and manipulate the American public. nice.